How many of us have dreamed of becoming professional darts players? Come on, hands up; I know I have. Was it that first 180 that you luckily threw? Or the great finish ending with the bull? Once you have thought about it for a few minutes (like I did), you calm down a little and push the thought of a professional darts career to the back of your mind. I am here to pull that thought back to the forefront. If you want to be a professional darts player, you need a professional dart board. Wait, who am I kidding? You should get a professional dart board whether you want to be a professional darts player or not. A great board is a perfect way for you and your friends to spend a few hours with a few beers. A dart board is inexpensive, easy to install, and provides hours of fun. We have found some of the best ones out there. We have our top-3 picks below, and after that, we have extensive reviews starting with a truly professional dart board. 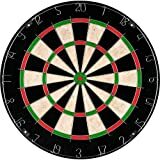 Bristle Dart Board, Tournament Sized Indoor Hanging Number Target Game for Steel Tip Darts- Dartboard with Mounting Hardware by Hey! Play! This is a professional dart board. If you want the best of the best, then look no further. We would recommend using this board when practicing for tournaments or for setting up your own competition with your friends. 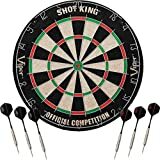 Great for anyone who wants to practice their darts game or have some friendly conversation with their friends. Great for groups of friends or for families. 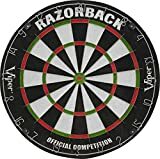 This dartboard is a wonderful choice for anyone who is starting out and wants a dartboard which is going to give them a professional experience. This is as good a dart board as you are going to get. With double-core technology, you are going to suffer from fewer bounce outs. The outer core has lower compression which means that the surface tension is reduced and point penetration is increased. The inner core has higher compression to increase the resistance, hold the darts, and improve the durability of the board. The wires on the board are also a big factor in making this one of the best out there. The wires have a smaller footprint, meaning that there is a larger scoring area, and they are sharper than they have ever been before. 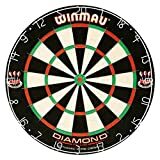 When you dart hits the wire, the angle of the dart will not be deflected as much as it is with other dartboards and will have more chance of sticking into the board. The reduced width of the wires means that you have a larger scoring area, especially important with the doubles and trebles. Attaching this board to your wall is also extremely easy. The triple-wheel lock system means that the board is easy to level, rotate, and then lock in place for your game. This is another board for those who are wanting to be great darts players. The best thing about this board is its durability. You can practice for hours and move the numbers to get a completely fresh board. This is an extremely good dartboard. It is tournament grade and has been endorsed by the British Darts Organization. There are a few things which we really like about this board, but the two which stick out are the self-healing fibers and the removable outer ring. The self-healing sisal fibers mean that the darts penetrate between the fibers and the pulled out, the fibers are so densely packed that they return to their original positions. Over time, the threads are not going to be damaged like other surfaces and are going to retain their shape and tightness. We also like the removable outer ring. 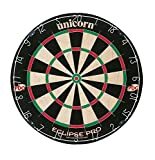 If you play a lot of darts, you will notice that there are areas of your board which take more damage than others (namely the 20 and the bull, unless your aim is as bad as mine). After playing for some time, you can remove the number ring and rotate it so that the space for the 20 is fresh and undamaged. This prolongs the life of an already durable board. This dartboard has been endorsed by the PDC and many darts professionals and champions. This may not be the same board which those players use in the big events, but it is the same quality as those boards. Unicorn has been a big name in the darts world for many years, so you know that you are getting great design and fantastic construction. This is not the best board in the world, but you know that you are going to get a board with enough quality that professionals are endorsing and practicing on it. The thinner wires mean that you have larger scoring areas, giving even the worst darts players the best chance at making a good score. The finest materials have been used to create a dartboard which will be perfect in any home. The bristles limit the number of bounce outs which you will encounter, and they fall back into place when your darts are removed to keep the dartboard in the best shape possible (and your backboard). You will likely be using steel-tipped darts, but you can also use soft-tipped darts too. This is great if you are playing with children and do not want them using the steel-tipped ones. The board is regulation size and has a thickness which will prevent your darts or the wall behind from being damaged. The spider wire is ultra-thin, and there are no staples in the bullseye. This means that you have more chance of hitting your doubles, trebles, and the bull, maximizing your score on each turn. This is an excellent dartboard for everyone and comes with darts. The durability means that you can have thousands of games with your friends without having to replace the board. This dartboard comes with all you need to get playing straight away. There are six darts included, and the board itself is easy to hang. It only takes a few minutes from getting your delivery to getting a game going. The tightly-compressed sisal fibers hold the darts well and self-heal once the darts have been taken out. Over time, you will notice that the bristles start to wear, with the number of darts being thrown into them. This is easily remedied by removing the outer ring and rotating it, bringing fresh life to your board. The bullseye is staple free, giving you more area to aim for. The wires have also been created to be as thin as possible to enlarge the already generous area, and the wires are angled to help the dart on its journey towards the board. 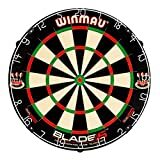 This is a great board for anyone wanting to try out darts for the very first time. Adults and children will find something from this board, and it also has enough quality for friendly tournaments and competitions with your friends and family. This is a great dartboard for all levels of players. The board can accommodate steel tips or soft tips making it great for adult and kids, professionals and amateurs. The tightly compressed sisal fibers will hold your darts well, limiting the number of bounce outs, and self-heal when the darts are removed. The staple-free bull also limits the number of bounce outs. The wires also have a smaller profile, almost negating any bounces off of the wires, and guiding them towards the scoring area due to the tight angles. We like dartboards with removable outer rings, like this one. They really do help to prolong the life of your dartboard without you having to do any repair work. Just remove the ring when an area is looking worn and rotate it a number or two. By doing this, you can prolong the life of your board by an extra few years. Is there automatic scoring on these boards? No there is not. For that, you will need to get an electronic dartboard. I'm afraid of damaging my wall - what can I do?